These colloidals are made to ~ 10ppm using low voltage electrolysis. This process makes nanosized particles suspended in a liquid that is mostly clear and tasteless. 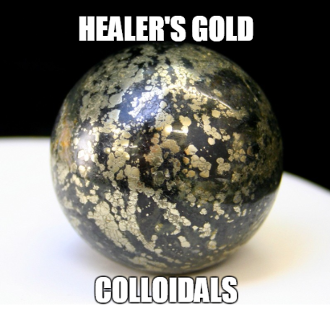 Healer's gold, can also be known as Apache Gold, is a metaphysical name that was bestowed upon a stone that consists of a mixture of Pyrite, an iron sulphide and Magnetite, an iron oxide. It exhibits a hardness of 6 on the Moh's scale and can be found in Arizona in the United States, where it is mined. It is striking in appearance, with its beautiful mixture of black and gold occurring in dramatic patterns. Healer's gold is considered to be a helpful ally for healers. This is because it is believed to boost the energy of both the healer and the receiver during a healing session. Whereas normally you might feel exhausted afterward, this stone can serve as a metaphorical cup of coffee, helping to beat that unpleasant side effect of feeling drained. In addition to this, one can expect from healer's gold a combination of the healing benefits offered by pyrite and magnetite. Pyrite is regarded as a stone of protection and intellect. It is believed to enhance logic, analysis, mental stability, intelligence, creativity, psychic development and memory. It is also said to have a very grounding influence. Magnetite may bring yin/yang energies into balance and align the body's chakras. It is often used to ease or dispel anger, fear, grief, attachment and confusion. It may increase its wearer or keeper's energy levels and endurance, as well as help to relieve burdens. Many claim that magnetite also emits a mysterious, attractive energy that summons love, good fortune and power, and that it guards us against infidelity. In keeping healer's gold as a companion, you may notice that you are feeling more decisive and that your outlook is becoming more positive. It may instill in you feelings of peace and harmony and strengthen your will. Also, consider keeping healer's gold around electronic devices such as computers in your home and/or workplace, since it is believed to provide protection from the harmful radiation emitted from them. As far as physical healing is concerned, apart from its ability to energize healer and receiver alike, you can expect from healer's gold a combination of the physical healing benefits provided by pyrite and magnetite. Magnetite has been used to relieve depression and agitation, lessen pain, alleviate bleeding and blood issues, fortify the circulatory system, and to give the immune system a needed boost. Pyrite is a wonderful physical healing stone of great power. It supports overall health and well-being and has been believed to help even in cases where people have seemed surely beyond help. It is also said to provide quick results. It is known for getting to the root of disease and shielding the body from infectious disease. It may also battle infertility in both males and females, stimulate proper function of the circulatory, respiratory, and endocrine systems, and provide additional benefits to the bones and in the case of DNA damage. Over all, besides being beautiful to look at, healer's gold is clearly a miracle worker of a healing stone and is aptly named.